A complimentary half-day city tour of Chinatown, Downtown, Stanley Park, LuLu Island Winery and a bonus mini ferry ride to Granville Island will be arranged for guests that arrive in Vancouver before noon (12:00pm). heart of the Okanagan Valley. Stop at the renowned winery to learn about the basics of wine making. 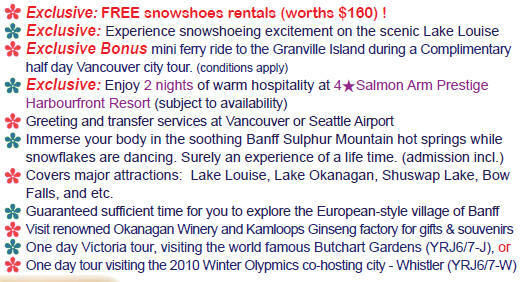 Wine tasting and purchasing of the popular icewine, red or white wine will be available. At Lake Okanagan, let us listen to its legendary story and search for the lake monster “Ogopogo.” Settle down at Salmon Arm in the evening. Proceed to the Eagle Pass and visit the “Last Spike” of the transcontinental railway where it connects the east and the west. Travel through the Rogers Pass. After a thrilling gondola ride* (optional) to the summit, you will be captivated by the majestic Rocky Mountains. Next, discover the town of Banff and Bow falls within the country’s first national park. Immerse your body in the soothing Banff Sulphur Mountain hotsprings. Definitely an experience of a life time (Admission incl.). Accommodation at Banff. 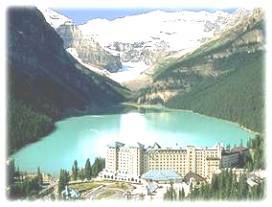 Surcharge for Hotel Upgrade to Chateau Lake Louise *CAD20/person, tax extra. snowshoeing experience on ice surface of the scenic Lake Louise③. 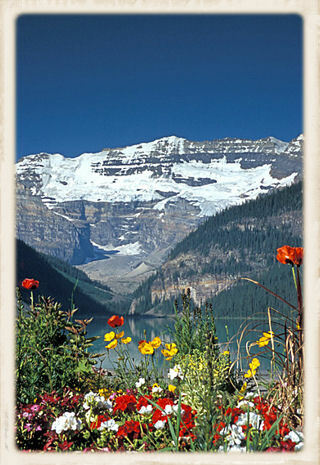 Enjoy an atmospheric lunch at Chateau Lake Louise (meal plan) and a promenade along the lakeshore. Settle down at Salmon Arm in the evening. Free day for shopping, visiting friends and family. Transfer to Vancouver airport afterward. .
Seattle departure: Depart in the morning and arrive Seatac approx. at noon (surcharge applies). Suggest flight after 14:30pm. * Free snowshoes rental: Please notify shoe size at the time of booking; this activity is weather-permitting; damage deposit $50 is requested. * Fares and Rockies Hotel Upgrade Surcharge are subject to change, please contact with us for details. * We reserved the rights to modify the itinerary, meal plans and hotels without liability. No partial refund on any unused services.